On the tail of Old School Renaissance has come another movement—the rise of the fanzine. Although the fanzine—a nonprofessional and nonofficial publication produced by fans of a particular cultural phenomenon, got its start in Science Fiction fandom, in the gaming hobby it first started with Chess and Diplomacy fanzines before finding fertile ground in the roleplaying hobby in the 1970s. Here these amateurish publications allowed the hobby a public space for two things. First, they were somewhere that the hobby could voice opinions and ideas that lay outside those of a game’s publisher. Second, in the Golden Age of roleplaying when the Dungeon Masters were expected to create their own settings and adventures, they also provided a rough and ready source of support for the game of your choice. Many also served as vehicles for the fanzine editor’s house campaign and thus they showed another DM and group played said game. This would often change over time if a fanzine accepted submissions. Initially, fanzines were primarily dedicated to the big three RPGs of the 1970s—Dungeons & Dragons, RuneQuest, and Traveller—but fanzines have appeared dedicated to other RPGs since, some of which helped keep a game popular in the face of no official support. Since 2008 with the publication of Fight On #1, the Old School Renaissance has had its own fanzines. The advantage of the Old School Renaissance is that the various Retroclones draw from the same source and thus one Dungeons & Dragons-style RPG is compatible with another. This means that the contents of one fanzine will compatible with the Retroclone that you already run and play even if not specifically written for it. Labyrinth Lord and Lamentations of the Flame Princess Weird Fantasy Roleplay have proved to be popular choices to base fanzines around, such as The Undercroft and Vacant Ritual Assembly. 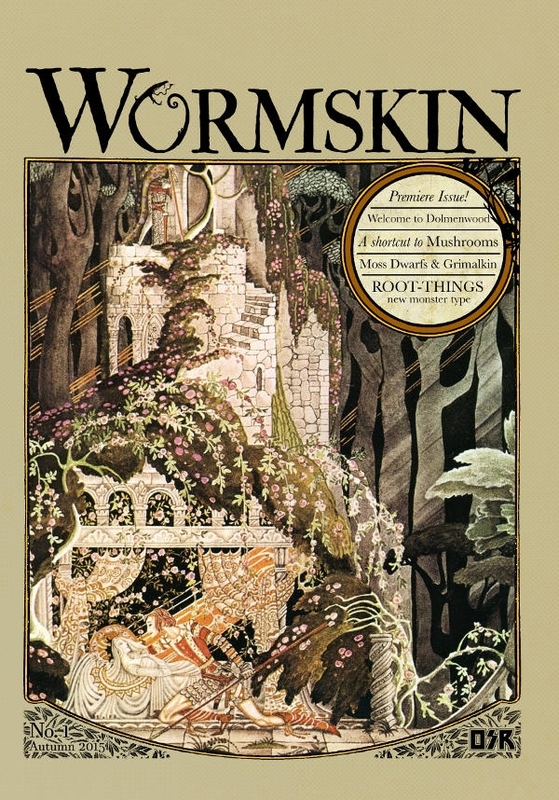 Launched and published in December, 2015, by Necrotic Gnome Productions, Wormskin—Issue One introduces Dolmenwood, an isolated woodland setting designed to be used with Labyrinth Lord and similar Retroclones based on Basic Dungeons & Dragons and Expert Dungeons & Dragons and to be dropped into most temperate, European-style campaign settings with relatively little fuss. Inspired by the works of Lord Dunsany, William Morris, and Susanna Clarke, the intention is that Dolmenwood is a mythical wood, an ancient place of tall trees and thick soil, rich in fungi and festooned with moss and brambles. There can no doubt that this intent is present in the pages of Wormskin—Issue One, but the fanzine has one fundamental flaw that undermines the content. This review will come to that flaw in due time. Wormskin—Issue One opens with a decent map of Dolmenwood, both the west and the east parts, done in quite nice detail. There is no background to the map, but there is plenty of detail to the map. The fanzine’s first substantial article is a full Race-Class, ‘The Moss Dwarf’. This is an eight-Level demi-human species with an affinity for the dank plants and moulds of deep forests like that of Dolmenwood. Short and stocky, Moss Dwarves have Fertile Flesh like toadstools growing from their joints and parsley chest hair, are immune to fungal spores, and practice ‘Knacks’ such Bird Lore, Nose Wise, and Pocket Lore. Each Moss Dwarf specialises in only one of these and gains greater understanding of each Knack as he acquires Levels. Thus a Moss Dwarf with Pocket Lore knows how many items someone has in his pocket, but at higher Levels knows what they are and can cause them to leap out of the pocket or swap places with items in the Moss Dwarf’s possession. All Moss Dwarves come to speak with plants and enter fungal symbiosis. There are details of Moss Dwarf armour and NPCs, but oddly, not on Moss Dwarf names—which is a pity. As a Race-Class, the Moss Dwarf is undoubtedly quirky and interesting, but whether you would use it away from the Dolmenwood or similar settings is another matter. This is followed by ‘Fungi of Dolmenwood’, a list and table of the thirty types of fungi that grow in the woods. The descriptions includes name, form, colouration, odour, and flavour as well as its effects. So Devil’s Grease is found as slime in the cracks, is black with ultraviolet aura, has the odour of off sausage, and the flavour of goose grease, and works as a strong psychedelic. The thirty range from the nourishing to the poisonous, though annoyingly one effect does require reference to a future issue of Wormskin. Accompanying the listing are notes on identifying, consuming, and buying fungi, which allows the DM to further apply them to his game. Apart from the reference to a then unavailable issue of Wormskin, ‘Fungi of Dolmenwood’ is definitely the best article in Wormskin—Issue One and easily applicable to almost any campaign setting. The second Race-Class in Wormskin—Issue One is The Grimalkin. This a ten-Level race of near-immortal fey cats that under certain circumstances transforms from its current form into the next stage of its life cycle and round and round again, and so on... So for example, the ‘Estray’, the humanoid form, can transform into the fat and stupid ‘Chester’ form if it eats too many mundane rats, or into a ‘Wilder’, its primal, feral form that is near invisible, if it is mortally wounded. Of the three forms, the Chester possesses no Class abilities, but the Estray can pick locks and cast magic spells and Wilder is semi-visible, stronger, and can move into the Otherworld, though is vulnerable to sunlight. All Grimalkin can spot the invisible, is susceptible to cold iron and silver, but when having drunk fermented catnip juice, can turn into a fighting drunk! Also included a a few new spells particular to the Grimalkin. Like the Moss Dwarf Race-Class, there is no discussion or inclusion of names for the Grimalkin, though several new spells are given. The challenge in playing a Grimalkin is essentially that of roleplaying a civilised cat, but one prone to changes in form and temperament. Despite its oddity, the Grimalkin would probably better than the Moss Dwarf in settings and campaigns outside of Dolmenwood as the Race-Class does not necessarily feel part of the mythic wood setting that its inclusion suggests. It is a weird Class, so the campaign itself would need an injection of the odd for it to fit, but it still could be fun to play. Rounding out Wormskin—Issue One is a description of a monster, the Root Thing. These are semi-humanoid tree root things that hunt humanoids so that they can die and decompose and feed their trees. The description is fairly basic, but for a simple monster like this it need not be complicated and the Root Thing hints at the more horrific elements to be found in Dolmenwood and is a decent addition to the region, though it would be suitable to add to other locations. The five articles in Wormskin—Issue One all do one thing. They give the DM interesting things to put in and encounter in Dolmenwood. What the fanzine does not do is tell the DM what Dolmenwood is (beyond being a mythic wood), how big it is, or give any physical description or any other details about it as a place. A map is provided—and a decent map it is too that can also be found here—but that is all. Which means that as good as the content to be found in this first issue of Wormskin, it is fundamentally useless in terms of using it as part of the Dolmenwood setting because there is no context. There is nothing to stop the DM from using it in his own campaign, but in terms of his running a Dolmenwood set campaign, Wormskin—Issue One is utterly useless. Behind its excellent cover, Wormskin—Issue One is physically nicely presented and self-assured. There are no editing issues, the layout is clean and tidy, and above all, it does not feel amateurish. The illustrations are reasonable and do fit the mythic feel that the authors are aiming for. 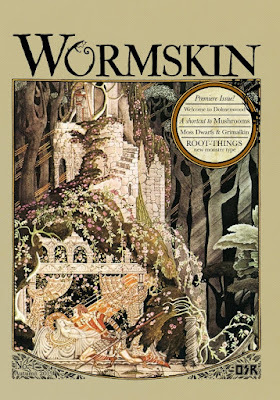 What Wormskin and Dolmenwood really need is Wormskin—Issue Zero.